There are a handful of characters in one’s life that can really have a profound affect on the shape of your life and career. For Jaime Montes de Oca, the executive chef at Zentan, there are three women who drove him to cook: his grandmother, a Colombian nanny he had growing up and Nancy, a kitchen manager/chef who worked with him when he was in high school. “I would stand and watch [our nanny] cook and I would help prepare food with her,” says Jaime. “It was a creative outlet, a creative way to fill mouths and stomachs.” When Jaime grew up and started working in the front of the house at a “turn and burn” restaurant at a Holiday Inn, Nancy was the one who advised him to go to culinary school if he was going to be serious about working in the restaurant industry. After acclimating to DC, Jaime found many things to love about the city. “DC is a very tight knit community. There are more chances for success here with the growing dining scene. With so much talent coming in it makes DC better,” says Jaime. 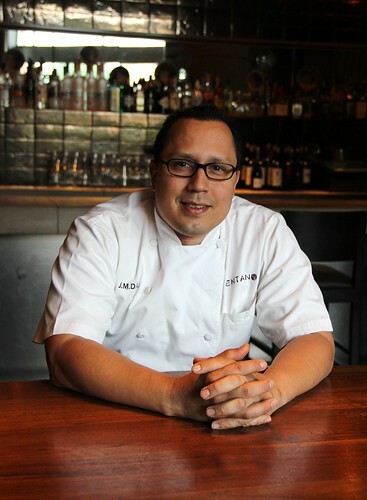 One of the bigger advantages Jaime found in DC was the closeness of the chef community. 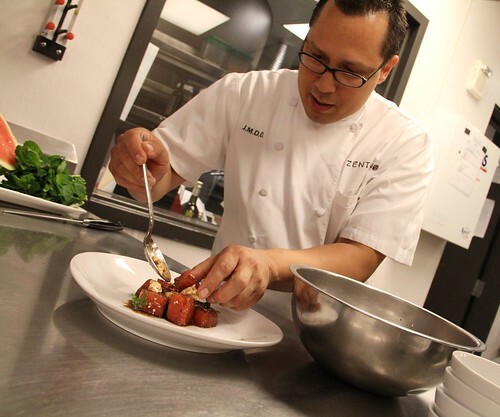 As for what he finds most rewarding about being a chef, Jaime says it’s all about interacting with the guests. “Sometimes you get to break out of the kitchen and meet the guests. When you see the emotion on their faces and that they loved [the food], it’s very rewarding,” Jaime says, adding in a story about a group of Brazilian tourists who flagged the chef down the day after their dinner to tell him how satiated they were. Back in the kitchen, Jaime says the biggest challenge is managing a staff of 15 to 18 people. “You have people with different personalities, languages, food experience–how do you deal with all of them equally, fairly and at the same time, differently?” he says. “You have to get results out of the kitchen and empower them, but also maintain control in the kitchen.” Talking with Jaime, it’s easy to see that he strikes a good balance between being the serious, razor-sharp focused chef and the guy who likes to be creative and put a lot of feeling into his food. There’s music in his kitchen, unless it starts to get unfocused. “It’s cooking, so let’s have some fun with it,” he says. 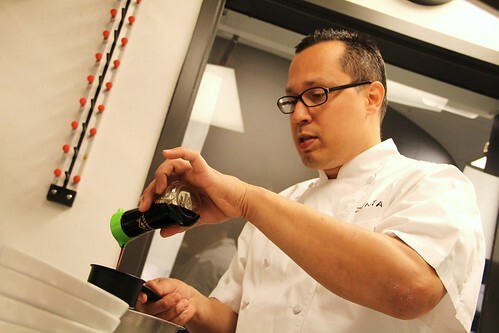 One of the unique parts of Jaime’s job is his ability to collaborate with chef Susur Lee, the owner of Zentan and yes, former Top Chef Masters contestant. “I get ideas from the seasons, places I’ve eaten, books, moods–anything that moves me to do something,” he says. “When Susur comes back from traveling we get to kickball around ideas in the kitchen.” One of the newer ideas at Zentan is lunch in the lobby of the Donovan House Mondays through Fridays. Jaime says an Asian-style fried chicken and fish and chips should be appearing on the menu soon. At some point, he says, he’d like to see Zentan’s lunch service get so busy that they’re forced to move from the lobby to the dining room. Check back at 3 PM for Jaime’s recipe for a refreshing watermelon salad with feta, mint and a black pepper vinaigrette. It’s the perfect salad for the summertime.